From the Cycle of Famous Men and Women. Andrea di Bartolo di Bargilla (c. 1423 - 1457), c. 1450. Detached fresco. 247 x 153 cm. Galleria degli Uffizi, Florence, Italy. Francesco Petrarca or Petrarch (July 20, 1304 – July 19, 1374) was an Italian scholar and poet, most famous for having invented the sonnet. He was a primary initiator of the philosophical movement of Renaissance humanism. While humanism later became associated with secularism, Petrarch was a devout Christian and did not see a conflict between realizing humanity's potential and having religious faith. Petrarch was an aesthetic conservative, who sought to recover the lost heights of Roman and Hellenic culture. He spent much of his time championing the ancient poets and literally digging through libraries in search of lost works. Yet ironically, despite his advocacy of classical Latin as the language of high art, he would write his most enduring poems in the Italian vernacular. In addition to his contributions to poetry, Petrarch was famous as a scholar, literary critic, and historian. His poetry and his prose espoused realism and a dedication to empirical knowledge, virtues which would be central to the Renaissance, which more than any other individual, Petrarch's activity would help to initiate. When his father died in 1326, Petrarch was free to pursue a career in writing. He returned to Avignon, where he worked in numerous different clerical offices. The work gave him the free time he needed to compose his first poems. 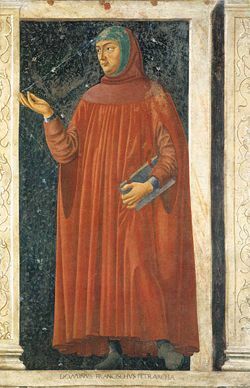 However, during this time Petrarch spent most of his time studying, particularly classical Latin, and in particular the works of St. Augustine. In Augustine, Petrarch would find a promise of a heavenly future that would influence him deeply throughout his life. Combined with his deep reverence for the culture of the past, Petrarch's reading of Augustine allowed him to see time as a progression towards greater and greater self-improvement, a thought that would become fundamental to his philosophy of humanism. In 1327, Petrarch would also meet Laura for the first time, the woman who would later inspire his greatest poems of unrequited love. In 1340 Petrarch published his first large-scale work, Africa; an epic in Latin about the great Roman general Scipio Africanus. The poem was wildly popular and Petrarch emerged as a European celebrity. The poem was well received in Petrarch's time because of its masterful imitation of classical Latin and its advocacy of the classical virtues of heroism and honor. In contrast to the clichéd and light-hearted poetry then popular in Florence, Africa resonated with brusqueness and authority. However, the poem today has fallen out of favor due to the very archaism that once made it popular. In 1341 Petrarch was crowned poet laureate in Rome, the first man since antiquity to be given this honor. He traveled widely in Europe and served as an ambassador. He was a prolific letter writer, and counted Boccaccio among his notable friends. During his travels, he collected crumbling Latin manuscripts and was a prime mover in the recovery of knowledge from the writers of Rome and Greece. Among other accomplishments, he commissioned the first Latin translation of Homer and personally discovered a collection of Cicero's letters not previously known to have existed. He remarked, "Each famous author of antiquity whom I recover places a new offence and another cause of dishonor to the charge of earlier generations, who, not satisfied with their own disgraceful barrenness, permitted the fruit of other minds, and the writings that their ancestors had produced by toil and application, to perish through insufferable neglect. Although they had nothing of their own to hand down to those who were to come after, they robbed posterity of its ancestral heritage." Disdaining what he believed to be the ignorance of the era in which he lived, Petrarch is credited with creating the concept of the Dark Ages which was later adopted, and greatly embellished, by subsequent writers. As a youth in 1327, the sight of a woman called Laura in the church of Sainte-Claire d'Avignon awoke in Petrarch a lasting passion, later celebrated in the Rime sparse ("Scattered rhymes"). Later Renaissance poets who copied Petrarch's style named this collection of 366 poems the Canzoniere ("Song Book"). She may have been Laure de Noves, the wife of Hugues de Sade and an ancestor of the Marquis de Sade. While it is possible she was an idealized or pseudonymous character—particularly since the name "Laura" has a linguistic connection to the poetic "laurels" Petrarch coveted—Petrarch himself always denied it. Her realistic presentation in his poems contrasts with the clichés of troubadours and courtly love. Her presence causes him unspeakable joy, but his unrequited love creates unendurable desires. There is little definite information in Petrarch's work concerning Laura, except that she is lovely to look at, fair-haired, with a modest, dignified bearing. Laura and Petrarch had little or no personal contact. According to his "Secretum", she refused him for the very proper reason that she was already married to another man. He channeled his feelings into love poems that were exclamatory rather than persuasive, and wrote prose that showed his contempt for men who pursue women. Upon her death in 1348, the poet finds that his grief is as difficult to live with, as was his former despair. Later, in his "Letter to Posterity," Petrarch wrote: "In my younger days I struggled constantly with an overwhelming but pure love affair - my only one, and I would have struggled with it longer had not premature death, bitter but salutary for me, extinguished the cooling flames. I certainly wish I could say that I have always been entirely free from desires of the flesh, but I would be lying if I did." Petrarch polished and perfected the hitherto unknown sonnet form for his poems to Laura, and the Petrarchan sonnet still bears his name. Ever since, the sonnet has been one of the most important forms in all of European poetry, and for good reason: the form demands that the poet evokes powerful emotions and imagery all in the limited space of a mere 14 lines. In addition to laying out the formal and metrical constraints of the sonnet, Petrarch also established the tradition of opening with a vivid image and, within nine lines, reversing the reader's expectation with a sudden shift (in Italian, the "volta") into a new and even more vivid metaphor. The form is comparable to the Japanese haiku in that it relies on an exquisite eye for detail while, at the same time, conforming to strict constraints of rhyme and lineation. The latter part of Petrarch's life was spent in journeying through northern Italy as an international scholar and poet-diplomat. Petrarch's career in the Church did not allow him to marry, but he did father two children by a woman or women unknown to posterity. Petrarch settled about 1367 in Padua, where he passed his remaining years in religious contemplation, although he was still very much sought out as a diplomat by Pope Urban V. He died in Arquà in the Euganean Hills on July 19, 1374. Petrarch is best known for his Italian poetry: notably the Canzoniere and the Trionfi ("Triumphs"). However, Petrarch was an enthusiastic Latin scholar who did most of his writing in this language. His Latin writings are quite varied and include scholarly works, introspective essays, letters, and more poetry. Among them are Secretum ("My Secret Book"), an intensely personal guilt-ridden imaginary dialogue with St. Augustine; De Viris Illustribus ("On Famous Men"), a series of moral biographies; Rerum Memorandarum Libri, an incomplete treatise on the cardinal virtues; De Otio Religiosorum ("On Religious Leisure") and De Vita Solitaria ("On the Solitary Life"), which praise the contemplative life; De Remediis Utriusque Fortunae ("Remedies for Fortune"), a self-help book which remained popular for hundreds of years; Itinerarium ("Petrarch's Guide to the Holy Land"), a distant ancestor of Fodors and Lonely Planet; a number of invectives against opponents such as doctors, scholastics, and the French; the Carmen Bucolicum, a collection of twelve pastoral poems; and the unfinished epic Africa. Petrarch also published many volumes of his letters, including a few written to his long-dead friends from history like Cicero and Virgil. Unfortunately most of his Latin writings are difficult to find today. It is difficult to assign any precise dates to his writings because he tended to revise them throughout his life. More than any other man, Petrarch is credited with inspiring humanist philosophy which led to the intellectual flowering of the Renaissance. He believed in the immense moral and practical value of the study of ancient history and literature - that is, the study of human thought and action. A highly introspective man, he shaped the nascent Humanist movement a great deal because many of the internal conflicts and musings expressed in his writings were seized upon by Renaissance Humanist philosophers and argued continually for the next two hundred years. It is not an exaggeration to say that the Renaissance, and by extension, the beginnings of modern Europe, all begin with Petrarch. Bishop, Morris (1961). Petrarch in J. H. Plumb (Ed. ), Renaissance Profiles, pp. 1-17. New York: Harper & Row. ISBN 0061311626.